I got this idea by the new topic "abandoned places"
If anyone interested, I have a CD with all pics of the German junkyard in Wilhelmshaven at the North Sea coast. I can ask a friend to make copies. But attention, over 3000 pages just in this thread! Yes, it's the link is to page 28, I got from him. Guess why. Here's some photos I took last year. Lots of Volvos. Note the Volvo 165 Express, that's SUPER rare! I guess everything which is junk and/or abandoned is interesting I think it's quite a natural thing really. What comes to abandoned cars I know a few of them near my place. 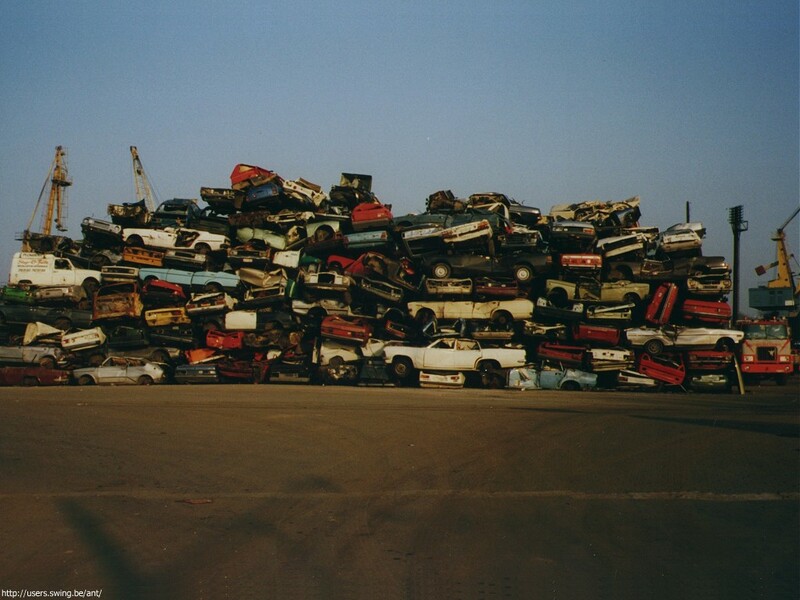 It is estimated that there are thousands, if not tens of thousands of junk cars abandoned in Finnish landscape. Traditionally it has been very easy to dump a car in forests. I have searched nearby woods and know a couple of junk cars. One is a Renault Dauphine (I don't have a picture of it) which is hardly recognizable. I have one hubcap from that car. Also I know a remains of a chassis which some say was a BMW/EMW. These cars below I just found last summer. I have somewhere the same pic but with most of the cars identified, I should find it. @atom: your're lucky, because the old Swedish junkyards have the best reputations in Europe at old-car-freaks. @Raul1983: I don't know, how it's in Finland, also good? In Central Europe I was getting less and less the last years, due the EU-laws. In Germany the most nice old junkyards were closed and cleared off up to 1998, when the law about them was getting more strictly. I remember my summer-vacations in 1992, where I spent some days to visit junkyards in Northern and Western Germany (just that ones, which had confirmed, that the had K 70's). It was unbelievable, not to compare with the situation nowadays. Sadly all of them were gone now. @atom: in 2000 I've visited a friend in Avesta. Just in that area and around Vesteras there were several junkyards, which had old cars. One was just a farmhouse, where the owner had made a half-legal auto-wrecking-business for a long time. Except 3 K 70 he also had 2 Opel Rekord A Coupe and many more oldtimers (perhaps I'll find the photos again). At one wrecker I've seen a Borgward Arabella in such a wreck-mountain linke Antoine has shown. He also had A Opel Kadett A and a Mercedes W110. I bought there a perfect engine-lid for a 1957-VW Beetle - for around 6,50 Euro!! In late 2000 I was again in Sweden, with a friend from Luxemburg, who has bought a K 70 in Gävle. we stopped at a junkyard in Motala at the lake Vättern. For a ridicoulous price I got the complete -perfect!- interior, the ivory-knobs of the dashboard, the engine-lid, chrome trims and many more nice stuff. @Antoine: I had the big luck to visit the Belgian junkyard, shown on the tinhunter-page. It was Carlo Vanlingen in Houthalen-Helchteren. It was unbelievable. I had not enough film with me to take photos. My friend Martin (the "tinhunter"-guy) has shot around 3000 pics over there. Hopefully he will made them on CD, too sooner or later. That yard was totally cleared off in 2000 - by the environment-laws, some local politicians were responsible for that. When I see the Mini, I remember a notice in our local newspaper. There was a pic with two abandoned cars, with the excited text "wrecks illegally thrown into the forest! Has anyone seen the offenders?" I must loughing loudly: one wreck was a Lloyd Alexander, the other a 1956-Beetle, both totally gone. It was a long long time ago, when the bad guys has thrown them over there. Should be hard to find witnessers after around 30 years. @ingo: Nice to hear about your travels thorugh Sweden! The place I posted is not a junkyard. It's some guy that have them standing long into the forest by his house/cottage. Since he never visits this house (he live in Gothenburg I heard, 70 km from this place) and the neighbour got angry and lit it all up (two or three times) to get rid of the junk. A co-worker is also partime fireman and he told me about this place and that I should visit it befor it's all gone, he said that the city would problalby tow it all away since it to hard to get there with the big firetrucks. And ingo, if you go to Sweden some more time you should problably visit "Kyrkömosse", I think it's the most famous "abndoned-car-place" in Sweden. I haven't been there myself but hope I could go soon. That's quite interesting. All I can identify in is a Renault 4 van, a couple of VW Golf Mk1s and a Ford Taunus. It never ceases to amaze me how many modern cars I'm seeing being scrapped here in the UK. Last time I visited the scrapyard, a 2000 Ford Mondeo, a 2000 Kia Shuma, 1999 Toyota Avensis and dozens of late 90's Peugeot 406s. @ecclefan: a reason is, that Britain is an Island and the cars are RHD - so the prices for used cars weren't hold up because of the Export. By the way: just this moring I saw a Polish truck, loaded with used British cars, Vauxhall's and Peugeot's, going eastwards on the Autobahn. I've looked for "Kyrkömosse" at Google - the first result was a collection of pages with cars from the junkyard, but nothing about the location. The most known Swedish junkyard over here is Töckfors. @chris: in Sweden, too? A few months ago I read something about a Trabant-fan in Britain, which had the same problems, that the neighbours want to force him to wreck his Trabant-collection. In the early 90ies, a classmate of me was busy with Trabant's, too. He had 4 cars standing beside his parent's house. One morning he woke up and 5 Trabants were standing there. He never had found out, who has stored the car there. @ingo: no, this was in the UK, in Derbyshire; probably the same one you heard of. After the wall came down there was a minor outbreak of Trabbis in the UK (though not as big as in Germany, TÜV notwithstanding), but they all seem to have vanished (probably into this guy's field). Ah, yes, my fault. I haven't read carefully, just the "Gothenburg" at the beginning. Yes, it's the story, I mean. Wow, why the hell would anyone want 49 of those hideous relics of the Cold War? lol! Trabants are representative of everything that was wrong with engineering from the Soviet bloc. How about cars under water? Umbria was an Italian ship which sank in 1939/1940. Looks like some new Fiat's were on board. 1. Sometime in the 1920's a new Rolls-Royce was ordered to Finland. The car was transported on a ships deck. A heavy storm struck on the way to Finland and the car fell to the water. 2. In the 1950/1960's for a while it was thought to be a good idea to dump old cars to sea where they would rot away. I've seen pictures of men pushing cars from the deck. Not far away from Cortez (CO) is the largest junkyard I´ve ever seen. Here a teaser. I have much more pics from there. I think it's Kyrkömosse that have that status, can't find any source on that right now though. I haven't heard about Töckfors, it's pretty close so maybe I could visit it soon.